Tries: Healy 3, Marmion, Adeolokun 2 Cons: Ronaldson 3, A. MacGinty 3 Pens: Ronaldson, A. MacGinty 2. 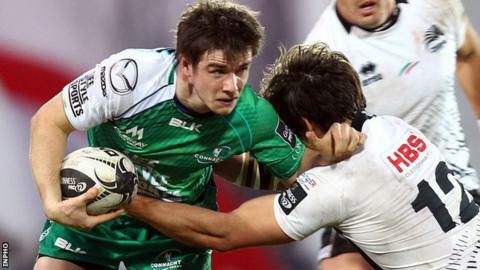 Matt Healy scored scored three tries as Connacht won a thrilling match away to Zebre to go top of the Pro12 standings. Niyi Adeolokun got two touchdowns and Kieran Marmion also scored for the Irish side, who are the competition's top try scorers with 42 this season. Johan Meyer, Kelly Haimona, Dries van Schalkwyk and Federico Ruzza responded with tries for the hosts. Connacht had never lost to Zebre and this was their 12th win over their Italian opponents. But Zebre pushed them all the way in Parma and were rewarded with a try-scoring bonus point. Craig Ronaldson and Haimona exchanged early penalties before Connacht wing Healy claimed the first of his three tries after good work by Bundee Aki and Tiernan O'Halloran. Haimona reduced the deficit with a 25-metre kick, but scrum-half Marmion soon wriggled over from a quick tap penalty and Craig Ronaldson converted. But in a sign of what was to come in a high-scoring second half, Zebre flanker Meyer powered over from a line-out and Haimona's conversion made it 17-13 at the break. Healy took AJ MacGinty's pass to extend Connacht's lead, but Haimona sneaked over within two minutes for another converted try. Connacht lost Eoghan Masterson in that incident, the back row replacement taken off on a stretcher, but Healy was soon racing over to complete his hat-trick and secure the Irish province's bonus point. Zebre replied again when number eight Andries van Schalkwyk intercepted the ball in his own 22 and ran the length of the field to score. But two tries from Adeolokun and the accurate boot of MacGinty, who had taken over the kicking duties after Ronaldson had left the action, finally gave Connacht breathing space. Replacement lock Ruzza grabbed Zebre's fourth try. Zebre: Muliaina, Toniolatti, Bisegni, Pratichetti, Van Zyl, Haimona, Burgess, Postiglioni, Fabiani, Chistolini, Koegelenberg, Bortolami, Caffini, Meyer, van Schalkwyk. Replacements: Beyers for Muliaina (50), Boni for Bisegni (57), Panunzi for Burgess (67), De Marchi for Postiglioni (59), Coria Marchetti for Fabiani (74), Ceccarelli for Chistolini (55), Ruzza for Meyer (57), Cristiano for van Schalkwyk (65). Connacht: O'Halloran, Adeolokun, Aki, Ronaldson, Healy, A. MacGinty, Marmion, Buckley, McCartney, Bealham, Marshall, Muldowney, Muldoon, Heenan, McKeon, Masteron. Replacements: Robb for Ronaldson (49), Blade for Marmion (59), Loughney for Buckley (59), Ah You for Bealham (59), Heffernan for Marshall (60), Masteron for Heenan (21), Naoupu for Masteron (45).